The subject of wedding gifts is one that’s often fraught with fear and danger. After all, when you’re talking about the single most special day of a couple’s life, how on Earth can you be expected to come up with a gift idea that’s as apt and fitting as it needs to be? Well, according to the experts at Memento Frames it is in fact largely impossible to go wrong with a high-quality personalised picture frame. The long and short of it is of course that you’re looking to give a gift that will play a role in both making memories and preserving them for life – what better way of doing so than with a personalised frame? But at the same time, it’s not quite as easy as just choosing at random and adding a few equally random words. If you really want to make sure the gift is every bit as welcome and cherished as it can be, you need to put a little more thought and effort into the selection process. First and foremost, don’t even think about leaving it to the very last moment to place your order for a personalised gift of any kind. While it’s fair to say that the very best brands on the market tend to fill orders as quickly as possible, the very nature of personalised gifts is such that there are far more things that can go wrong. And when they do go wrong it’s not the end of the world – unless of course you’ve gone and ordered at the eleventh hour. So the first tip is perhaps the most important – plan ahead, WAY ahead. When it comes to the actual design of the frame itself, it’s always better to go with something simple, timeless and ideally quite minimalist. The reason being that simple blacks, whites and silvers for example are universally compatible with any kind of interior décor theme. And as you don’t know where the happy couple may end up living in the years and decades to come, it’s better to give them a frame they’ll be able to display with pride no matter how they choose to decorate their interiors. Of course, the fact that keeping it simple also makes life easier for you is also an added bonus! One fantastic idea for creating a unique wedding gift like no other is to consider investing in a handful of photo frames which can be used to preserve memories from the various parts of the day and the days prior. From the pre-wedding parties to the ceremony to the reception and indeed the honeymoon, a series of frames positioned side by side can really help create a much more vivid overall image of the events that took place. For reasons that are plainly obvious, there really isn’t a man or woman on the face of the Earth that would like the idea of having the most important photos of their entire life displayed in frames of poor quality. As such, to give a thoughtfully personalised frame or set thereof, that doesn’t measure up the mark in quality stakes is to give a gift that’s unlikely to ever be used. 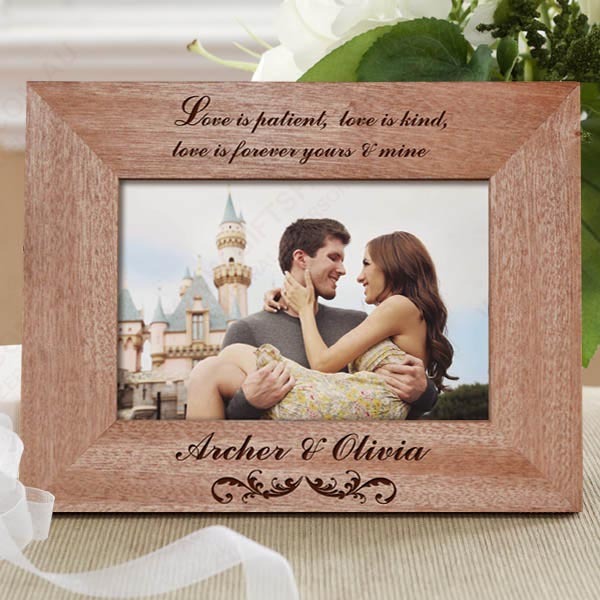 The same also goes for the engraving of the frame itself as there are in fact a great many different engraving techniques in use right now across the industry. There are those that create rather rough-looking results and at the other end of the scale there are those that are guaranteed to impress. So once again, as the importance of the images to be displayed is rather on the high side to say the least, there’s really no room at all for cutting corners when it comes to the quality of the engraving. Last but not least, it’s often tempting to pretty much copy or replicate a common message when it comes to choosing what appears on the frame. Sure, it’s easier to just look up a few ideas online that to dream up your own, but the whole point of these kinds of personalised gifts is that they carry messages directly from your heart. As such, even if it takes you some time and even if you’re not the greatest person with words, make sure that every last word the frame featured comes from you. Even if it’s hardly a work of pure poetry, the more it sounds like your true voice, the more it will mean to the recipient.